This has got to be one of the coolest things anyone has ever done. On February 6, 2018, Musk shot his Tesla roadster convertible with a space suited dummy in the driver’s seat on a SpaceX Falcon Heavy rocket into an orbit around the sun. The car is now further away from the sun than Mars is. It will circle the sun for billions of years. We’ll all be gone one day, but that car, and that dummy, will be like new, orbiting the sun. The fact that a private individual can pull this off is fascinating to me. Say what you will. Go SpaceX! While we quibble here on Earth about little things like tax cuts, there are other worlds out there, with mountains, and valleys, and ancient washes. Here is a panoramic picture of Gale Crater, where the Curiosity rover landed in 2012 and has been working since. I sit here, watch this, and reflect on my little place in the world. Other than the bright white star in the center, every object in this image taken by Hubble is a galaxy. Each galaxy has hundreds of millions of stars of its own. The film Agora deals with the life and times of Hypatia of Alexandria, arguably the most illustrious woman in the history of Greek science. The scant historical accounts of her life dwell on the gruesome death she is reported to have suffered in the hands of a Christian mob. Yet this part of her story (tragic as it is) is less compelling than her reputation as a leading mathematician and astronomer at the twilight of ancient pagan culture. A beacon of the Hellenistic Age, Alexandria in the late C4th was becoming the epicenter of escalating social tensions between various religious factions vying for political power. The authority of an impartial Roman governor was under constant challenge by Jews and Christians. Yet in spite of the political turmoil, Greek science flourished in the Library of Alexandria under the mathematician, Theon. Hypatia, his daughter, would have been well versed in Geometry and Astronomy under her father’s tutelage. To understand how she became memorialized as a Martyr of Science, we need to step back to an earlier period. Greek Astronomy was based on a geostatic and geocentric cosmology. A complex system of interlocking circles had been proposed by Ptolemy (c. 150 AD) to explain what seemed to be erratic planetary orbits. The system was designed to preserve the Greek geometric ideal of uniform circular motion. Although generally accepted, this astronomical model was weighed down by its unwieldy complexity. Could Hypatia have raised doubts about the Ptolemaic system? This is the intriguing question underlying a pivotal theme in Agora. The film speculates that Hypatia toyed with a simpler heliocentric model and may have even proposed elliptic orbits for the planets (a theory in keeping with her own publicized study on conic sections). Furthermore, we know that she was schooled in Neoplatonism, which assigned a prominent role to the Sun in a universe guided by intelligent design. In short, could Hypatia — an avowed Neoplatonist — have been perplexed by the incongruity between Ptolemy’s inelegant theory and her own ideal image of a heliocentric system? Agora is a courageous film: intellectually, for its bold imaginative leap; visually, for the meticulous depiction of ancient multicultural Alexandria with its famed Library. Rachel Weisz is an intrepid Hypatia, unmoved by ardent suitors, and defying a superstitious mob. The film dramatizes the clash between pagans, Christians, and Jews. Amenábar deserves credit for his unapologetic exposure of the savage horde that brought down the Library of Alexandria and extinguished the life of one of its most celebrated luminaries. Agora broke box office records in Spain, but failed to get wide distribution in the USA. I have never seen a total solar eclipse. As we are preparing for our trip to Montana and Idaho to be there in the path of totality on August 21 in Idaho Falls, I came across this video that describes the experience. Now I am getting excited. Our sun has a diameter of about 1.3 million kilometers and it’s about 150 million kilometers away. Let’s say we shrink the size of the sun down to the size of a human red blood cell. That’s about 7 micrometers. It would be a really, really tiny speck, not visible with the human eye. If the sun were that small, the entire solar system would have a diameter of about 5 centimeters, about the size of a tangerine. However, the solar system isn’t really a ball, like a tangerine. All the planets orbit around the sun on one plane. So it would be better to describe the solar system as a thin disk the size of a tangerine. Even that’s not a good description. In the center is the sun, with 99.9 percent of all the mass in the solar system. Remember, the sun is the size of a red blood cell. You can’t even see it. The eight major planets are fantastically smaller still. And those eight planets make up the tangerine-sized disk. Enough about the solar system and tangerines. Now that we have a sense for the solar system made that small, how far away do you think the nearest star system is? That would be Alpha and Proxima Centauri, which is about 4.3 light years away from here. The answer is 219 meters. That’s a little bit more than the length of two football fields. Ok, let’s picture that. The sun is an invisible speck the size of a red blood cell with the solar system the size of a tangerine. Then the nearest star and its planets is another tangerine more than two football fields away. Just imagine the massive amount of empty space in all directions, left, right, forward, back, up down of empty space, and then another tangerine-sized star system. Now let’s visualize the nearest stars to our sun. It turns out that there are only about 77 stars within a sphere of 33 light years diameter around the sun. There are a few prominent stars among those 77, like Alpha Centauri, Sirius and Procyon, the brightest of the bunch. Many of the 77 are not even visible with the naked eye. Regardless, those are the 77 nearest stars. How big do you think a 33 light year bubble around us would be, if our solar system were the size of a tangerine? It would be about 1,680 meters. That just a bit more than a mile. So picture a bubble a mile across in all directions, with the solar system in the center, the size of a tangerine. Inside of that one-mile bubble in space, there are only 77 other star systems, 77 tangerines, floating around. And that’s our close neighborhood of only 16.5 light years on all directions. Our Milky Way Galaxy is a disk of about 100 billion stars. The disk has a rough diameter of 100,000 light years. If our solar system is the size of a tangerine, then the Milky Way is about 5,000 kilometers across (or about 3,000 miles), or roughly the size of the continental United States. So picture yourself walking around the country and encountering these little solar system disks of 5 centimeters across spaced out every two football fields in all directions, and you get a sense of how wide open and empty our galaxy is. And that’s just ours. Recent estimates are that there may be a trillion, that’s a million million, galaxies in our universe. The world is a very large and very empty place. 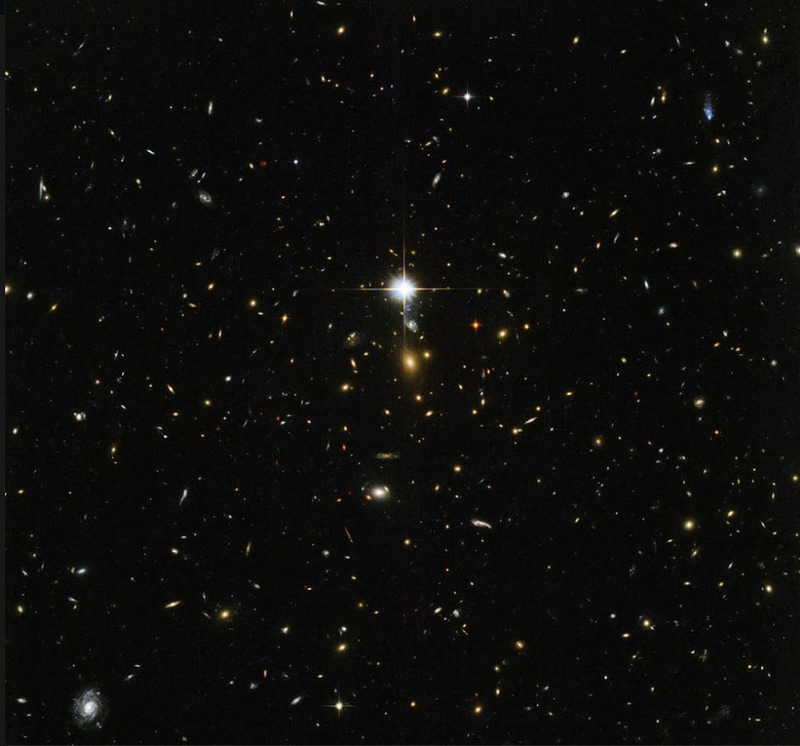 Astronomers have just recently come to the conclusion that there are two trillion more galaxies in the universe than previously thought. We used to think there were 100 billion galaxies. Our own galaxy, which is a pretty unremarkable one, is estimated to have about 400 billion stars. Let’s just say there is only ONE intelligent civilization in every galaxy that is active and alive today. Just one. That would make it two trillion civilizations. There are about 7.5 billion human beings on earth. That means that there are 266 intelligent CIVILIZATIONS in the universe for every human being alive – right now. This is beyond what I can fathom. Just How Big is the Milky Way? If the earth were the size of the period at the end of this sentence, then the Milky Way would be the size of the continental United States. 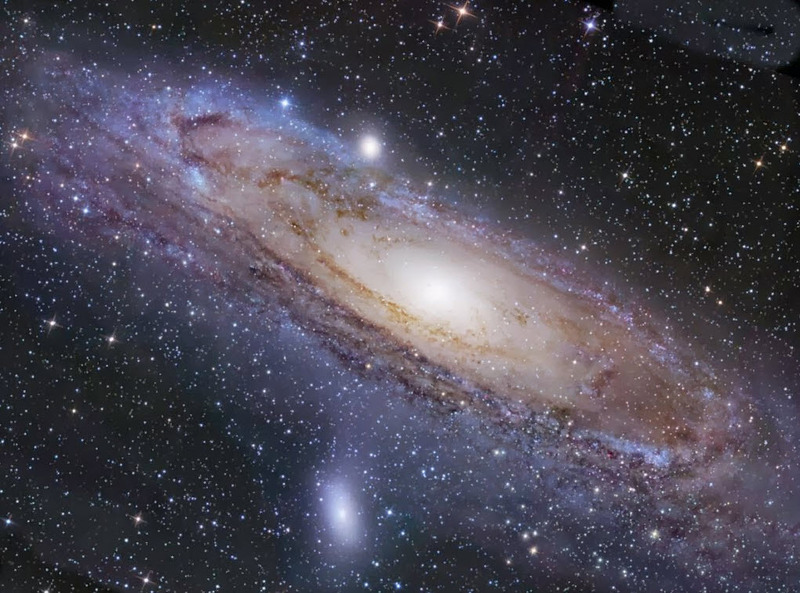 At that scale, the Andromeda Galaxy would be a pinwheel about twice the size of the continental United States, floating about 40,000 miles out in space, or about a quarter of the way to the moon. Now look at the earth again: —> . On July 19, 2013, the Cassini spacecraft slipped into the shadow of Saturn. With the bright light of the sun hidden behind the planet, it was able to point the camera at Saturn to take the first picture that showed Saturn, with Earth, Mars, Venus, seven of its moons and the rings, all in one shot. JPL source here. It shows our planet not as a blue marble, but as, per Carl Sagan, a pale blue dot. All of human history, all of human suffering, all the wars for this god and that god, all the subjugations by kings and dictators through the millennia, all killings for greed and lust, happened on that little speck of dust almost a billion miles away from this vantage point. It seems to me we should not make it unlivable by heating up its microscopically thin atmosphere by burning fossil fuels. Where would our grandchildren go? Two of Saturn’s moons. Dione is the nearer one, and Enceladus is the snowball in the back. They are made of the same material, but obviously Enceladus has much higher reflectivity. Enceladus has a 314 mile diameter. That means it would just about fit between Phoenix and San Diego. 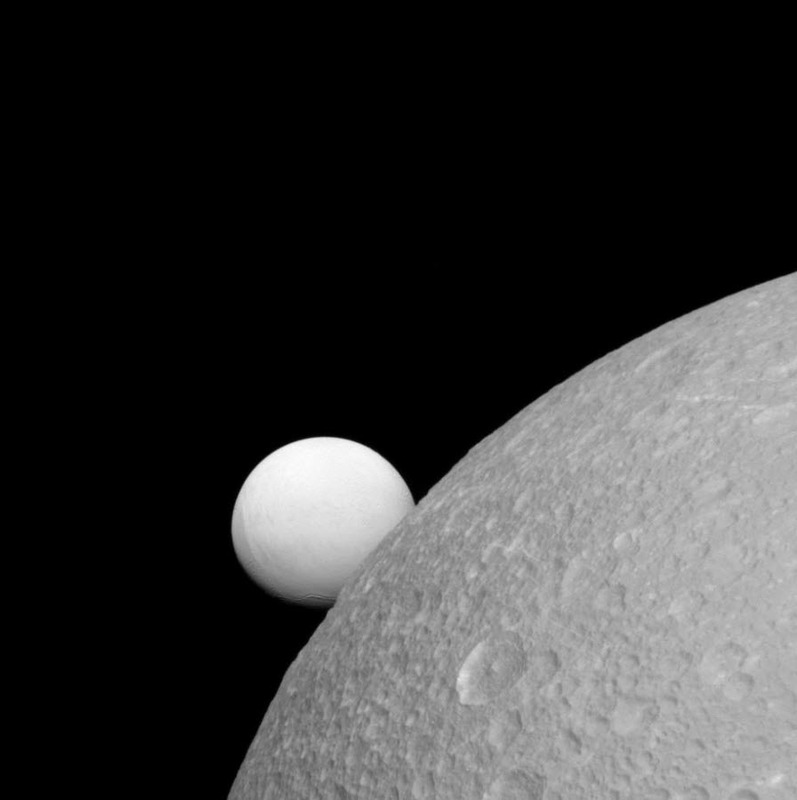 Dione in the foreground has a diameter of 698 miles, more than twice that of Enceladus. It’s the 15th largest moon in the solar system. It is boundlessly fascinating to me that we live in an age where we can see the moons of a far-away planet in this detail. Over six years ago I reviewed the book by Sam Harris titled The End of Faith. More relevant today than ever, it is a searing indictment of all religions and how they counteract progress, science and the good and peace in our modern societies. The Muslim religion is lately singled out as one of the strongest culprits. It’s the one religion that somehow gets teenagers to put on suicide belts and blow themselves up in public places. It’s the one religion that does pseudo-medieval reality shows showing YouTube videos of choreographed beheadings. It’s the one that’s associated with atrocities today. That was not always true. Christianity had its share of killing, genocide, persecution and corruption on a gargantuan scale over the centuries. Fortunately Christians stopped committing atrocities on a large scale around the 1600s or so (for the most part). Muslims never stopped, and they continue to commit them now, with the help of social media, automatic weapons, and shipments of oil. So, yes, the “good Muslims” are not happy with this, and I understand them. Yet, without a doubt, the fundamental tenets of Islam foment the insanity we are witnessing today. I invite you to read The End of Faith to educate yourself about all the adverse effects of religion in general and Islam in particular. This is one of the highest resolution images of Pluto released so far. I have reduced the size so I can display it here. I remember fifty years ago, as a young boy, reading books about our solar system, when images of the outer planets were fuzzy blobs at best. I am a techie, I am into science, and I am absolutely delighted that I live in a time and an age where I can see an image of Pluto, an object 4.7 billion miles away, with this clarity. Light itself takes 4.6 hours to get there. The New Horizons spacecraft which took this picture, flying by Pluto at a speed of 50,000 km/hour, took 9 years and 8 months to travel there. And I get to sit here and post this picture on my blog.